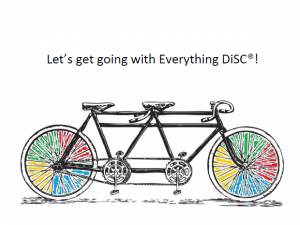 Reading and interpreting your DiSC results is so easy with Everything DiSC®. You don’t need to be a psychometrician or go through any special training. Your assessment is tabulated electronically and results are delivered in an easy-to-read and memorable narrative. The people at Wiley who work on these reports take great care with them. They are written in non-judgmental language and at a 5th grade reading level. Both the assessment and the report went through several stages of testing and refinement before being released. Adaptive testing was introduced recently to increase the validity of results. You can feel confident in the results. It’s really not enough just to know a bit more about ourselves. 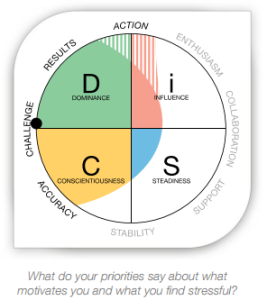 We work and live with others, so Everything DiSC reports provide information about how to interact with other styles. 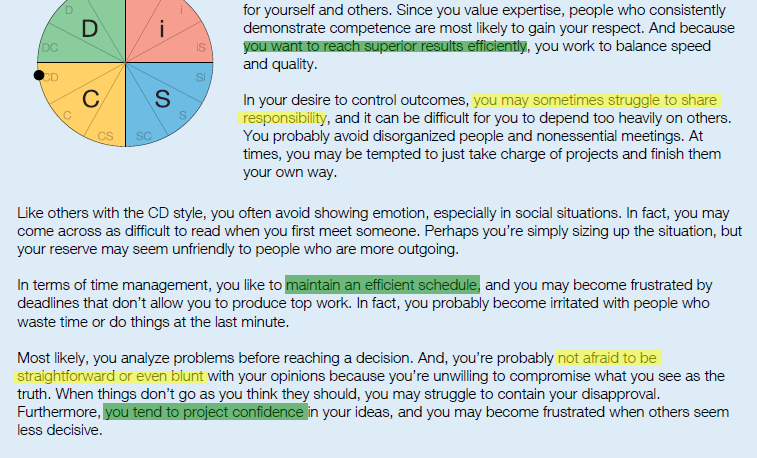 The Everything DiSC Management profile, for example, details what is likely to motivate each of the four DiSC styles. The Sales profile offers insights into likely priorities of clients with different styles. The publishers of DiSC first offered a profile with a graph of one’s results. But they found that people just couldn’t recall that image, nor did it really illustrate that everyone is a combination of styles—that we can all flex into another style when desired. The “DiSC dot” does a better job. 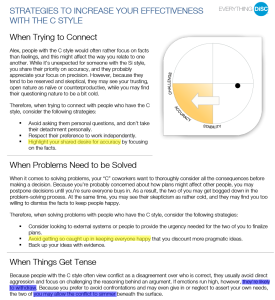 Most (about 82%) of people will find that their dot is located in the outer half of the circle, showing a stronger inclination for the priorities of that style. Some people have multiple priorities and the shading on the circle reflects that, if present. Our reports give you some ideas about how to make use of what you’ve just learned about DiSC. They are specific to the assessment taken. 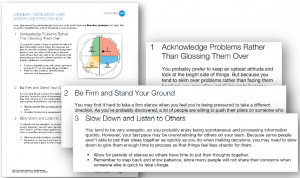 Reports will have action steps or tips for improvement or for adapting your style. 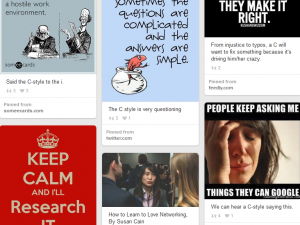 These are reports you’ll want to keep and refer back to during your career. 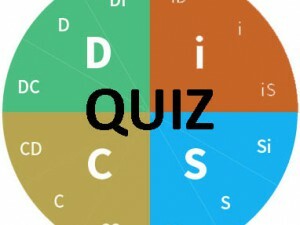 Individuals and organizations use Everything DiSC in several ways. 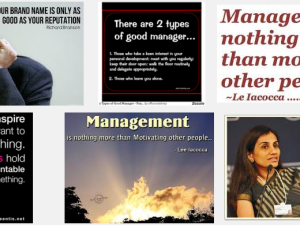 One person might find it helpful when writing a resume or preparing for an interview, another for working with his manager or for increasing her leadership effectiveness. In our office we use it to onboard new employees, to work more effectively together and I think we’ve all used it with our spouses or significant others as well.